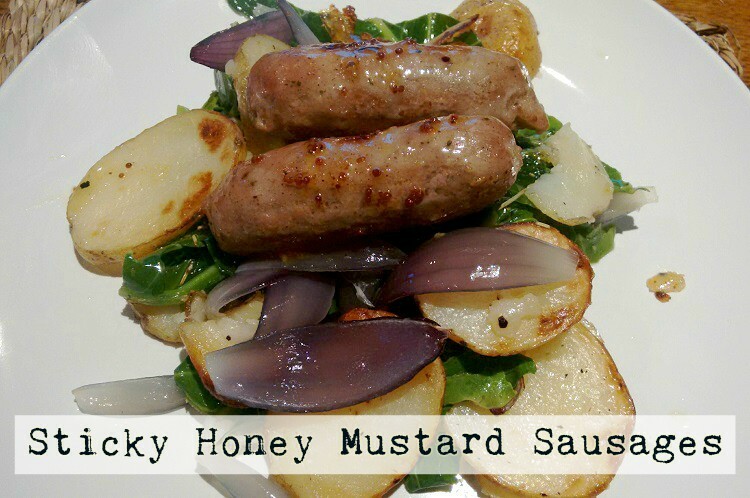 Sticky Honey Mustard Sausages is another one of the Gousto recipes, but this time I had not tried it before. I found it to be quick, easy and very filling, plus I don’t usually like things like spinach, spring greens or kale, but the spring greens in this recipe were really good. This recipe can be made cheaper depending on the amount you buy and where you buy the ingredients from. *The recipe actually asks for 5g of Fresh Rosemary (30g 70p 12p, the total would be £3.27), but I did not want to waste any because it comes in a 30g bag, so I opted for dried. 1. Preheat the oven to 220°C. Slice the potatoes into thick discs leaving the skin on. Cut the onion into wedges through the root leaving the skin on. 2. Add the potatoes and onion to one end of a baking tray, then drizzle oil and season with salt and pepper. 3. Add the sausages to some tin foil and place at the other end of the baking tray (or use a separate tray). Put all of it into the oven for 20 minutes. 4. Combine the honey and mustard in a bowl. Strip the rosemary from the stems and chop finely. Peel and finely chop the garlic. 5. Cut the leaves off the spring greens and discard the stalks. Then slice them into thin strips. 6. Take the onions out of the baking tray and leave to cool on a chopping board. Turn the potatoes over, then pour the honey and mustard mixture over the sausages making sure to turn the sides of the foil up to stop any escaping. Return them to the oven for 5 minutes. 7. Remove the skins from the onion and separate the rest into petals. 8. Heat a large pan with 1 tbsp of butter over medium heat, then add the rosemary, garlic, spring greens and a pinch of salt. Cook for 2 minutes. Add a splash of water cover with a lid and cook for a further 2 minutes, then remove from the heat. 9. Serve the potatoes, spring greens and onions all together. 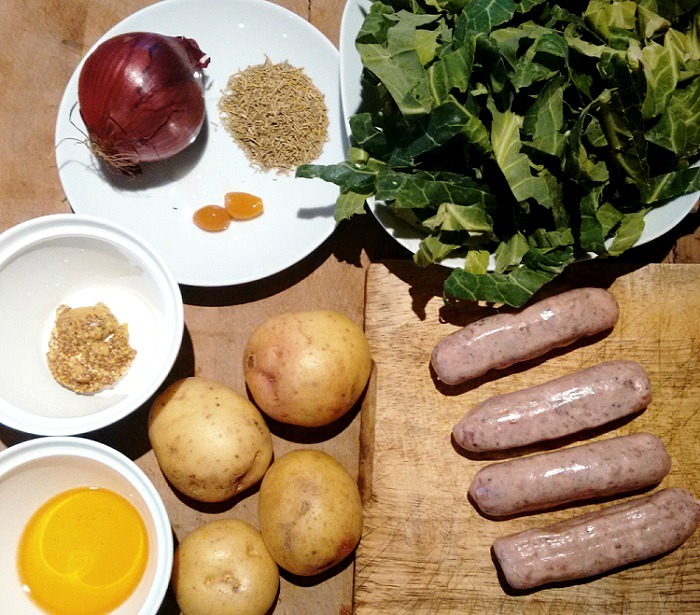 Top it off with the sausages and a spoon of the honey mustard mixture.